Recently, reading many comments on these pages, my memory has been jogged about the location of Hogtrough Bottom. So, as an aid to those wondering about the exact location for Hogtrough Bottom, I have attached here an extract from an old Brighton street map. The dew pond location, also mentioned on many comment pages, is about 100 yards up the track from Heath Hill Avenue, as shown by the broken line passing through the name Bevendean. Strangely this location does not appear on many maps. Look to the lower right above Norwich Drive. I have also attached a section of an old OS. 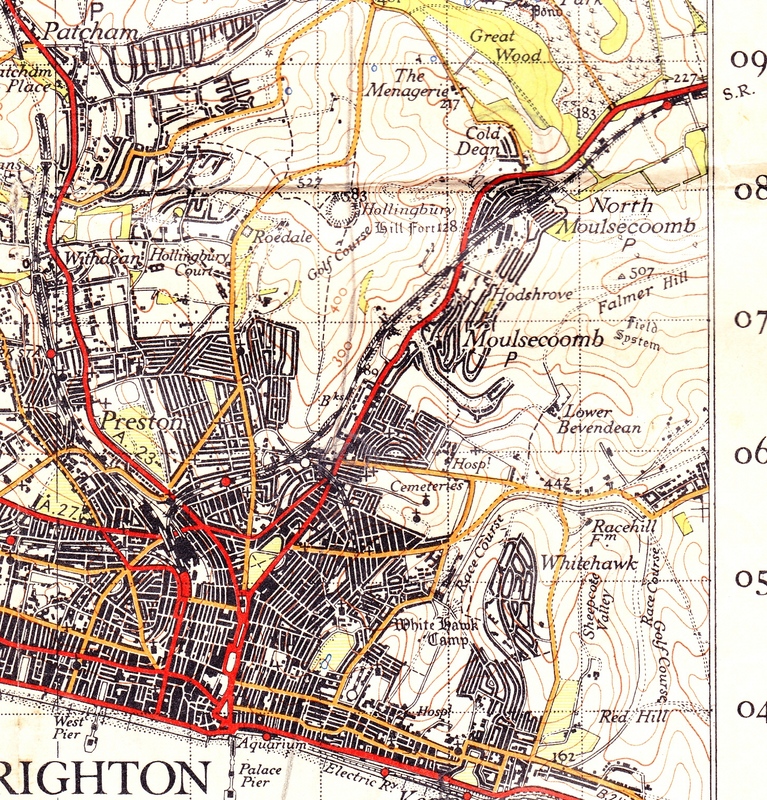 Map (1946) of Brighton and environs to aid others whose memories go back further. During the 1950s and 1960s, this pond was always overgrown and used as a hiding place, along with the rabbit warrens further to the west, for children’s games. Obviously since then it has been restored as kids we never knew it was lined with concrete. Although I was only about 3 years of age at the time, I can remember the road surface being concreted in Upper Bevendean Avenue, by a happy and friendly gang of men who were possibly Italian POWs. They were certainly popular in our street, the young ladies looked after them very well, taking them trays of tea and biscuits. Are there some ladies out there today who can remember this time? Hogtrough Bottom. 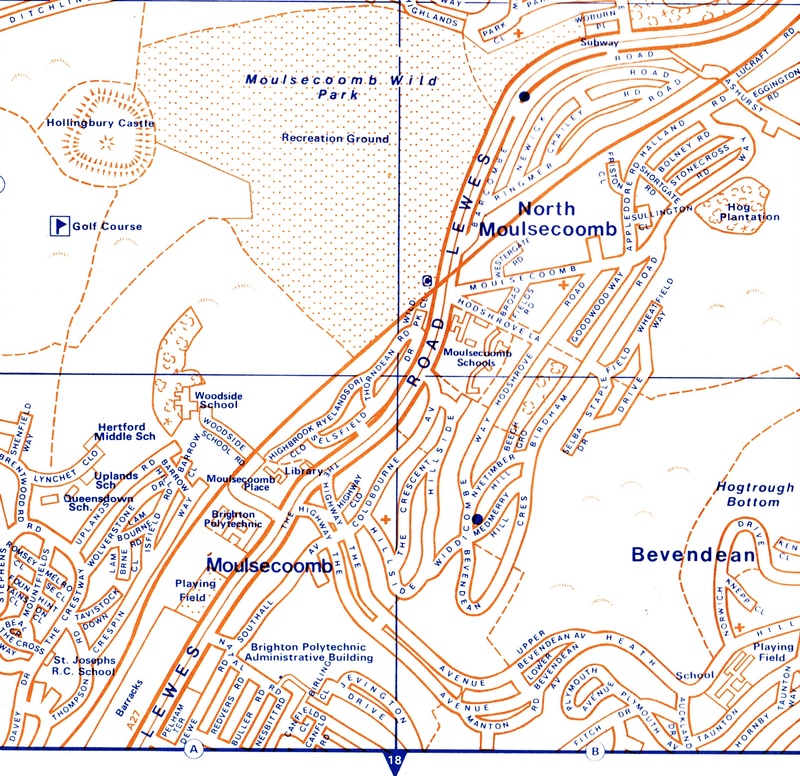 Bevendean and Moulsecoomb. I was born in Bevendean Crescent in 1964. My maternal grandparents lived in Hodshrove Road and my paternal grandparents lived in Whitehawk. Our back garden had a gate that went out onto a small path that led to a child’s version of heaven… ‘The Giants Po’… ‘The Slide Bank’… ‘Hogstrough Bottom’ and many more places where children ran wild and free. Many happy hours were spent exploring with my brother Neil and our dog Bobby. I got lost once when myself and a friend decided to visit the horses up the top of ‘Jacobs Ladder’ and we couldn’t remember our way back. And a vague memory of an adventure playground but that was quite a hike and I’m not sure how we got there? Happy memories of chilhood times.